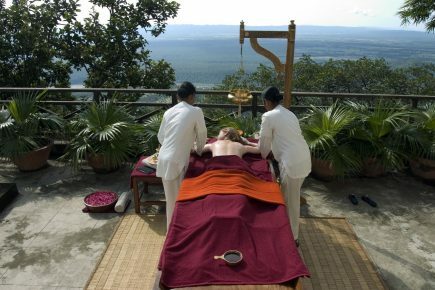 Set in a breathtaking national park at the Himalayan foothills, just 40 minutes from the yoga world capital of Rishikesh (some serious ‘omm’ going on here – it’s where The Beatles first met the Maharishi) The Ananda is one of the finest destination spas in Asia. The Ayurvedic (Sanskrit for Life-Knowledge) Rejuvenation Programme begins with a lifestyle consultation focusing on your physical, mental and emotional health to help determine your dominant Dosha. The three Doshas (dynamic living forces) are Kapha, Pitta and Vata – one being dominant in most people. Treatments and diets are geared to balance the three forces to achieve optimum wellbeing. Heavy and slow Kapha was my dominant Dosha, so I was prescribed a fresh light diet of fruits and vegetables combined with Ayurvedic treatments, yoga, meditation and a light exercise regime. Each Ayurvedic treatment begins with a cleansing foot ritual and a melodic prayer. Some of the most holistic and spiritual treatments I’ve found – one of my favourites being ‘Pizhichil’ where warm sesame oil is poured continuously over the body for 45 minutes. Ananda’s food concept is based on this belief and through incorporating key principles from Ayurveda. Cuisine is fresh natural foods low in fat and calories with an emphasis on whole grains, fresh fruits and vegetables, lean proteins, low-fat dairy products, and the avoidance of added or artificial salts, colors, flavors, or preservatives. The objective is to provide a rejuvenation cuisine for guests, who, whilst relaxing, desire to re-vitalize their body and soul through a healthy approach to diet and lifestyle. This is reemphasized by the show kitchen at Ananda where chefs instruct on how to make these dishes at home so that one may continue that ‘way of life’. Special care menus are provided in consultation with the in house Ayurvedic doctor, to align the specific imbalances of the various body types. Five nights in and I literally felt like I was floating on air – clear eyes, skin and head with a new lease of life.